Application: Offices, Colleges, Hospitals, etc. Application: HRMS, Marketing Management, POS, Asset Management System, Accounts, CRM, Payroll etc. System Requirement: Window 7, Window 8, Window 10 etc. We are offering ERP Software Packages to our clients. 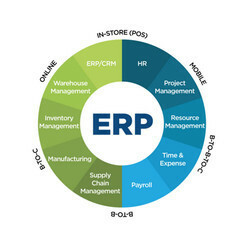 We are engaged in providing Tally ERP 9 Software Service. We are instrumental in providing Enterprise Resource Planning Services to the clients. We have skilled and experienced engineers and technicians, who enable us to cater the exact needs of clients. This panning service is provided after discussing with the customers. While providing these panning services, we follow industry norms and guidelines in the entire process. Start thinking differently. Start thinking smartly. We are indulged in offering Manufacturing Erp Software to all valuable clientele. This software is available in different forms that meet on clients demand. We offer these services at reasonable rate. To make this software as per customers demand, we use advanced techniques. BizSol Enterprise resource planning software or ERP is true ambition that attempts to integrate all departments and functions across a company onto a single computer system that can serve all those different departments' particular needs. ERP solution for factory management.